I'm sorry to disappoint all my loyal readers, as there are actually quite a few of you out there, but I just don't have the will to write a good post today. As sometimes happens, I had this great idea all planned out that simply did not materialize the way I hoped it would, so I'm going to take the night off and save it for tomorrow. In the meantime, don't forget to check out all the other Twins blogs out there: Twins Geek, Aaron Gleeman (who's skill level I hope to someday approach), Seth Speaks, and last but not least, BatGirl. BatGirl is really moving into the mainstream now, as she even has her own Online Emporium! How cool is that--official merchandise for a blog! If you're also looking for something interesting to read, I highly suggest that you check out Chris Kline's minor league tour diary over at Baseball America. Kline is a writer for BA, and the Pirates' organization agreed to let him become a "player" for both their AAA and high-A minor league teams for a week. He did everything that the players did except play in the games, including batting practice. This 8-part series (and I highly recommend you read them all) is both hilarious and informative at the same time. If you've ever wondered what life is like for the thousands of professional players who AREN'T in the major leagues, you'll get something out of this diary. Plus, former Twins catcher Tom Prince happens to be the manager at single-A Lynchburg, which is one of the teams that Kline "played" for. I always knew Princey would make a good manager someday and it appears that day has come sooner rather than later. Just thought I would share this interesting tidbit. I did go the game yesterday afternoon, and even though it was disappointing that the Twins lost, I'm not entering panic mode just yet. Gardy had very few options out of the pen, and I'm glad we finally saw the true colors of Aaron Fultz. Jesse Crain wasn't overly impressive in his stint either, but I'm now fully convinced that Fultz should be the one to go next week when Balfour gets healthy. Thanks for stopping by Twins Chatter and hanging in there with me while I fly solo for the second time in the past month. The difference between writing 2 or 3 and 5 posts a week is actually larger than I imagined, but I'll keep throwing my thoughts, analysis, and opinions out there every day in case something sticks. Have a good one. This is the view I had from my seat on Monday afternoon. Lower GA is still the best deal in town! Whoa. If what took place on Sunday afternoon was not the longest baseball game that I have ever watched or attended or participated in, then I will eat my hat. The game went all Energizer Bunny on the Twins and just kept going, and going, and going, and going... you catch my drift. Despite the fact that the Hometown Nine came out on the short end of the stick, it was still a highly entertaining game to watch, one of the best all season long in my opinion. Who would have thought that Carlos Silva would extend his scoreless streak to 15 innings and nearly outduel Mark "Cy Young" Mulder? Or that Christian Guzman, of all people, would come up with the clutch 8th inning homer (which he absolutely crushed, by the way) to tie the game at 3 apiece? Or that Joe Roa (!) would pitch five innings of one-hit baseball? 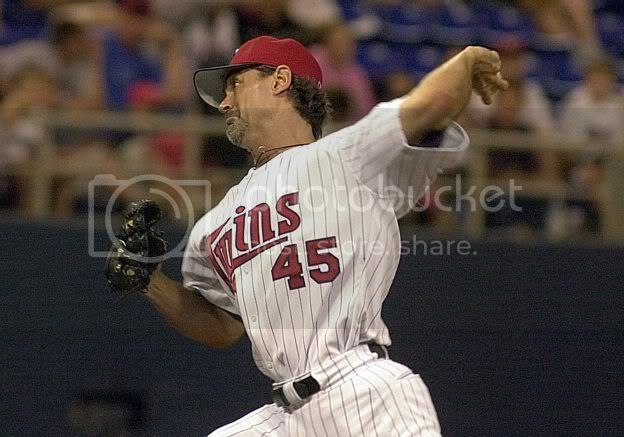 Or that the Twins bullpen would throw 10 (!) straight scoreless inning? Or that the recently rejuvenated Twins offense would go 10 innings without scoring? Who would have thought that Terry Mulholland would promptly give up three runs in his only inning of work and render all those other accomplishments totally meaningless? Okay, I would be willing to bet that most of us could probably have seen that last one coming, but you can't be too hard on ol' Gramps. He had already thrown a bullpen and done his regular workout earlier in the day, so he understandably had even less on his pitches than he normally does, if that's even possible. Even though it came in a losing effort, it was still a fun game to watch that included some memorable moments. New utilityman Augie Ojeda made his Twins debut, and once again reminded us all just how short he actually is. Guzman's homer was the second dramatic home run of the series that caused the Twins to use up their bullpen in a losing effort (Shannon Stewart's 9th inning homer on Friday being the other). And for those of you who watched the bottom of the 18th because you are a "never say die" Twins fan (or just couldn't find anything else to watch on TV) saw Justin Morneau literally golf a baseball about 415 feet over the centerfield fence, which was an almost awe-inspiring feat. All these extra inning games are taking their toll on the Twins bullpen, however. The starters have been doing their part, but Juan Rincon, J.C. Romero, and Joe Nathan have pitched quite a bit recently. Gardenhire was so concerned about Rincon's workload that he opted to bring in Mulholland, Tuesday's scheduled starter, instead of the team's top setup man. That's Gardy's call, but it sure would have been nice to hold the A's for a couple more innings with Rincon in there. Once again, I was very impressed with the performance of Joe Roa. His five innings means that Rincon, Nathan, Fultz, and Crain will all probably be available for today's game. They might all be needed, seeing as Kyle Lohse will be the one to toe the rubber. Roa once again proved that he is a very valuable member of this team and needs to be retained when Balfour comes off the disabled list. Sunday's loss bothers me a lot less now that the Twins hold a comfortable six game lead over both the White Sox and the Indians, who have taken advantage of Chicago's ineptitude (and failing health) to seriously challenge the Sox for second place. I'm planning on writing tomorrow's post about these two teams and what the Twins should expect in terms of pressure for the season's final two months. I'm cutting off today's post a little sooner than normal because I'm getting up a little earlier and heading out to Metrodome for today's series-ending tilt. I'm planning on testing out the $715 million investment all the Minnesota taxpayers put into our new light rail system (I don't include myself in that group since I don't actually pay taxes yet). 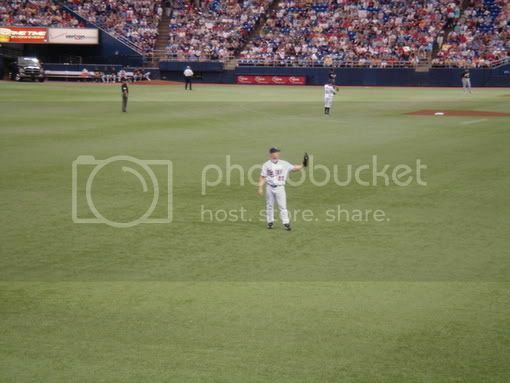 As you've undoubtedly seen already, it stops right at Metrodome and is supposedly quite the cat's meow. Hopefully this Kyle Lohse start will go better than the last one I attended, in which he was lit up for seven runs by the Red Sox. If in fact he has turned the proverbial "corner" then hopefully we'll see a little proof of that this afternoon.